From Barnet to Bromley and Tower Hamlets to Twickenham, the third round of the Mayor of London’s crowdfunding programme has seen communities across the capital come together to transform their local areas. And last night twenty projects, including everything from restoring a lido in Peckham to a sustainable fish and chips truck in East London, came and pitched their brilliant ideas to a live crowd at London’s Living Room at City Hall. Meet all twenty brilliant projects here. Each project had just two minutes (and mate, check out the timers on the screens, we were strict!) to sell their idea, what its impact would be and why it was important, before pressing our giant red button to find out the size of the pledge (up to £20,000) that they would receive from the Mayor of London. Each of these projects was carefully selected from over 60 ideas put forward by community groups looking to play an active role in regenerating their local area. They form part of a larger programme that will see £1.3m invested in at least 80 community-led projects across the capital with thousands of Londoners expected to pledge more than £1m worth of additional crowdfunding, skills and resources to help make these projects happen. After receiving a pledge from the Mayor the projects now have just one month to complete their campaigns and since crowdfunding is an ‘all or nothing’ model these projects now need YOU to help make them happen. Last night alone we had 105 people in the audience contributing £5872 alongside the Mayor towards the projects highlighting the amazing catalytic effect of the Mayor’s pledge. 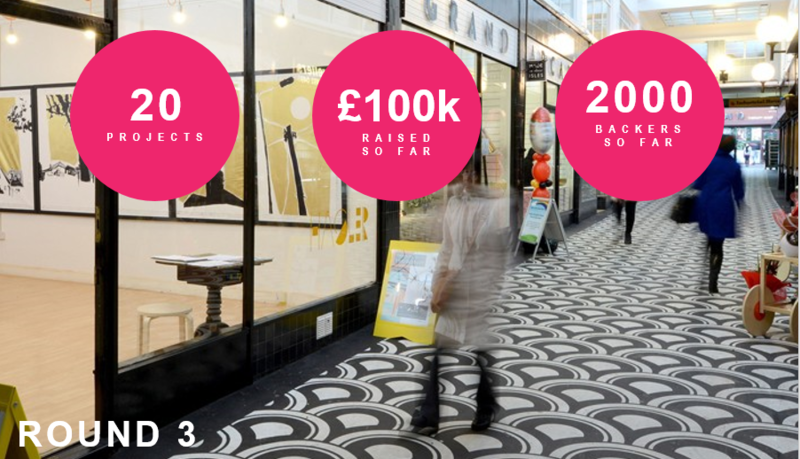 The Mayor pledged £225,000 to the twenty projects, who together have attracted over 2,000 backers and raised £333,111. See the full list of Mayoral pledges below and play your part in #CrowdfundLDN and back your favourite projects here. The next round of the crowdfunding programme is kicking off in autumn 2016. Find out more and register your interest by visiting www.london.gov.uk/crowdfunding. The Big Park Sleepover 2016 (Lambeth) – a free summer sleepover camping mini-festival for local families in the heart of London’s Myatt’s Fields Park on Sunday 28th/Monday 29th August 2016. They received £7,500 from the Mayor of London. The Carpentry Club (Tower Hamlets) – fitting out a workshop to a professional standard and fund a programme of events to encourage increased and sustained engagement by the local community. They received £9,500 from the Mayor of London. Colour in Romford (Romford) – a campaign to bring street art to the town, brightening up a grey high street and creating community spirit. They received £9,500 from the Mayor of London. The Eel Pie Island Museum (Twickenham) – a new museum celebrating the musical history of this unique island, and the role it played in the British blues explosion of the 1960s. They received £8,00 from the Mayor of London. Freshwell Mobile! (Hackney) – a pop-up stall displaying healthy fruit and vegetables at the heart of communities and estates to improve health and well-being by giving access to affordable fresh produce to those needing it most. They received £17,000 from the Mayor of London. Kitchenette Karts (Tower Hamlets) – a healthy, sustainable fish & chips truck in the heart of the East End, that will create pathways into entrepreneurship for young East Londoners. They received £15,000 from the Mayor of London. Melting Pot @ London Sculpture Workshop (Greenwich) – a community ceramics hub and foundry to upskill communities through material engagement and widen participation in creative learning across all demographics. They received £20,000 from the Mayor of London. Old Kent Road Studios (Southwark) – transformation of 60 vacant garages on the Ledbury Estate into spaces for workshops, studios, cooking lessons and cultural activities where people can learn and socialise. They received £20,000 from the Mayor of London. Paxton Primary allotment (Lambeth) – engaging parents and volunteers from the community to support children at school with growing their own vegetables and selling it on at affordable prices. They received £3,000 from the Mayor of London. Peckham Lido (Southwark) – The once loved Peckham Lido has been buried underground for almost 30 years. This group now want to bring it back, better than ever, for the whole community to enjoy. They received £7,500 from the Mayor of London. Pengelicious (Bromley) – a real food festival for Penge SE20, for local residents and traders to share their recipes and dishes, cooked by local people and businesses using ingredients from local suppliers. They received £500 from the Mayor of London. The Phoenix Garden Blooms (Camden) – re-landscaping and refurbishing the garden for new visitors, coinciding with the reopening of the garden after the construction of a new community building. They received £10,000 from the Mayor of London. Punch and Juicy Market Place (Brent) – a healthy juice academy and Root-to-Market programmes with a pop-up market stall, helping the social enterprise to become self sufficient and teaching young participants valuable skills. They received £10,000 from the Mayor of London. Raise the Roof at Lordship Hub (Haringey) – weather-proofing Lordship Hub’s terrace to increase its capacity and continue to serve as a hub for the local community. They received £6,000 from the Mayor of London. Seeing the Wood for the Trees (Ealing) – a project to share this gem of land with its surrounding community in the form of a Forest School. Engaging attendees in this natural environment to learn and explore all it has to offer. They received £11,000 from the Mayor of London. Uplift Salcombe Gardens Shops (Barnet) – a makeover for six tired and unattractive shopfronts that will improve their trade and the local street-scene. They received £20,000 from the Mayor of London. V22 Workspace Creche (Hackney) – a new creche set in a studio space in Dalston, with access to a community garden; an innovative solution for artists, freelancers and creative entrepreneurs who are also parents. They received £6,000 from the Mayor of London. Weavers Kids Cafe and Community Pizzeria (Tower Hamlets) – a not-for-profit café that will teach young people to cook and sell affordable, healthy meals, with costs funded by a Community Pizzeria also helping to sustain Weavers Adventure Playground. They received £13,000 from the Mayor of London. Well Street Market (Hackney) – an innovative new model of a community market, offering locals access to healthy, affordable, good quality food along with a Teenage Market, Student Makers Market and live music stage. They received £20,000 from the Mayor of London. The White House Community Garden (Dagenham) – a new community garden on the Becontree Estate. This new social space is part of a locally listed former farmhouse, being renovated for community use and artist residencies. They received £10,000 from the Mayor of London.